The development of trade has been materially aided by the formation of Association of Merchants. In the beginning, Chambers of Commerce were established principally at the port towns and their functions included, inter-alia, the measurement and weighment of goods for calculation of steamer freight and harbour dues, preparation of schedules of rates for various services and undertaking arbitration in commercial disputes, besides supplying their members with information connected with their business. They were consulted by Government on questions relating to commerce, and the more important of them were invited to nominate representatives to the Provincial Legislative Councils, and to the Port Trusts in the case of seaport towns. In some cases, they were also represented on the municipal board. The majority of the members were European firms, which had the larger share in foreign commerce and also usually in manufacturing enterprises. On 28th December, 1857, a year before the demise of the East India Company, a group of European merchants consisting C.E. Mirus, R.H. Peirce, J.H. Berry, N. Fitzgerald, A.S. Lawson, H.Huni, Geo Brunton, S. Darley and P.Leslie, representing 8 firms, had a meeting, perhaps over a dinner or at the club, when it was decided to found a Chamber of Commerce in Cochin, essentially as an independent, voluntary body. Fort Cochin, where the Chamber was founded, was the earliest European settlement in India. Many a battle was waged here in the centuries gone by, by Dutch, the Portuguese and the British in their struggle for supremacy. The earliest surviving record available is the Annual Report for the year 1857 which shows that the first Chairman of the Chamber was James Oughterson. 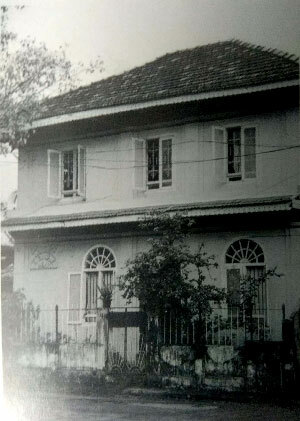 He was originally connected with the firm of Oughterson Campell & Co., a mercantile establishment which started in Cochin 1849. On its dissolution in 1851 James Oughterson started business in his own name, principally in timber and shipbuilding. Most of the early firms started their trading in Malabar produce as also in coffee curing and shipping agency and were branches of firms in England, Colombo or Bombay. Of significant interest is the fact that the two established firms in Cochin, namely, Aspinwall & Co. and Peirce Leslie and Co. can trace their origin to Oughterson Campell & Co. The old Chamber building at Fort Cochin. One of the worthy traits of the early pioneers was a willingness to co-operate with others for the common good and to speak with one voice on issues affecting their mutual interests. Thus, the idea of ‘association’ was mooted. At the first annual general meeting held on 19th April, 1858 the formal rules of the Chamber were adopted; the objects were to promote friendly feelings among the mercantile community of the Port, to collect and record information on all matters of mercantile interest, more especially of the Malabar Coast, to exert itself in obtaining the removal of the acknowledged grievances and to advance, by all means within its sphere, the common good. At the beginning, the rules and regulations of the Chamber did not bar native merchants from being enrolled as Members; nevertheless, the Chamber came to be identified as an organization representing mainly the interests of the European Merchants. It is noteworthy, however, that the revised Rules adopted at a General Meeting of the Chamber held on 28th September, 1877 restricted the eligibility for admission as members to “Europeans engaged in mercantile produce of the Malabar Coast.” It was not until 1936 that the Committtee of the Chamber declared their intention to amend the Chamber’s constitution to admit Indian firms of standing a regular Members or Associate Members. At a meeting on 11th September, 1917 the rule of the Chamber had been amended to the effect “that firms wishing to become members must be duly proposed and seconded and secretly balloted or voted for by a major of the 2/3 of the Chamber’s members.” Interestingly enough, the rule of admission by ballot survives to this day. In the early period, the Chamber was not particularly anxious to attract all firms of the Malabar Coast to its membership and, indeed, in terms of a resolution passed at a meeting held on 28th April, 1905 April, new admissions were restricted to those who had been established in the Malabar Coast for a minimum of three years. The year in which the Chamber of Commerce was inaugurated belonged to a time when local commercial activity had not grown to any degree of importance to warrant the formation of a collective body to defend common interests. F.S. Davis in his Book “Cochin-British and Indian” says: “so far as one can discover from enquiries made and from such documents as are still in existence there was little commerce and no commercial activity after the English took Cochin. All information goes to show that for half a century there was complete stagnation. There was no telegraph till 1859, a very significant fact, and no Bank till 1862. Communication with England was possible only by mail, and cable facility was not available under the 70s. 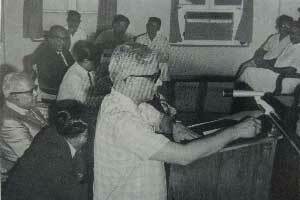 It is significant, therefore, that among matters which engaged the attention of the Chamber during its first year were the advancement of such causes as a branch Railway Line to Cochin connecting Beypore, extension of telegraphic line to Cochin, procuring a tug steamer for towing of ships in and out of Cochin Port at all times and to render assistance to vessels in distress, and improvement of the postal delivery system. In the early years of the foundation of the Chamber the principal exports from Cochin included coconut oil, copra, coir yarn, coir fibre, coir matting, coir rope, coffee, cardamom, ginger, peper, nuxvomica and lemongrass oil. The early years of the Chamber coincided with a time of virtual free trade with no controls. Towards the end of the 19th Centray these firms diversified into import trade which helped in balancing exports and exchange; and provided two-way cargo which undoubtedly enabled the shipping companies to procure agencies. The Chamber has played a valuable part in encouraging the growth of fair and well-understood commercial usages and in providing acceptable means for commercial arbitration. The Chamber formulated clear and precise procedures for recognition of practices as the ‘custom’ of the port. The earliest Act of the Chamber was the adoption of Cochin tonnage scale for various commodities exported from Cochin together with rules for measurement of shipment cargo. One of the guiding principles of the Chamber has been the right of individual businessmen to decide for themselves the contractual relationship which best suited their particular businesses and to act accordingly, the Chamber remaining strongly opposed to any legislation or forms of dictation. The Chamber also organised a system for collection of statistics relating to overseas trade (exports and imports) and these are still available in Chamber’s records from 1889 onwards. All those compiled previous to 1889 were unfortunately destroyed in the great Cochin fire which broke out on 4th January of that year when a pattemari (country sailing craft), lying off the premises of Brunton and Co., caught fire. The Chamber always remaining concerned about the establishment of high standards of probity in business affairs. At a meeting of the Chamber Committee held on 30th September, 1917, it was resolved to move the government to appoint an analyst for the purpose of checking adulteration and offered that the expenses in connection with the employment of the analyst be recovered by a levy on all produce. As early as 1877, the Committee of the Chamber felt that it would be desirable to provide the means for approbation or censure of all actions of the Chamber by ensuring genuine disclosure and resolved that the proceedings of the Chamber be kept open for inspection to the Editors of newspapers. By actively involving in the civic life of Cochin, the Chamber contributed very materially to the usefulness of the municipal institution. The Chamber’s record of achievement in civic matters is worthy of mention. It took an active part in obtaining an electric power station for Cochin, all weather surfacing of roads and provision of protected water supply to Fort Cochin. 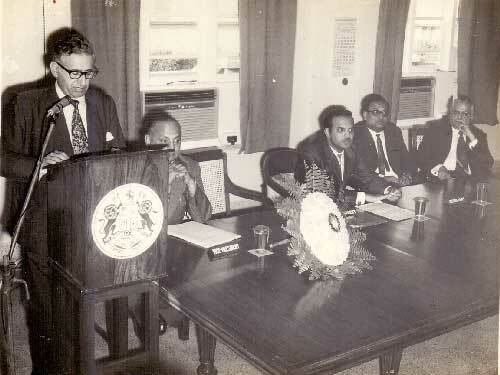 In recognition of its contribution to civic affairs, the Chamber was not only given a seat in the Cochin Municipal Council to voice the interests of the Commercial community, but also, for a long period of time, the Chamber’s representative was traditionally elected to serve as the Vice-Chairman of the Cochin Municipal Council. Owing to the peculiar administrative set-up of Fort Cochin which was a part of the Malabar District, then part of the Madras Presidency, there existed certain difficulties arising from conflict of jurisdiction. These, however, were easily solved because of the strong nexus, which the Chamber had built up with the Resident Representative of the Governor of the Province accredited to the Native States at Bolghatty. In September 1880, the Collector of Malabar intimated the Chamber that, since it was difficult to get a European/British subject for the joint post of Judge and Magistrate at Cochin, the Government was disposed to appoint leading British subjects of the town to be First Class Magistrates and Justice of Peace to sit as a bench for adjudication of all criminal cases in which European and British subjects were the defendants. On the recommendation of the Chamber, a number of European merchants were selected for investiture with the necessary powers. The Chamber always believed that responsible business should have regard for the well-being of the society at large. Apart from taking cognisance of its obligations to the civic needs of the town in which it was situated, the Chamber extended generous support for a number of appeals for donations for worthwhile causes. The earliest appeal considered by the Chamber was from the Municipal Chairman of Fort Cochin 1897 for monetary assistance to enforce quarantine regulations against the passengers arriving from Bombay who were affected by bubonic plague. The fact that the Chamber paid a bonus to the staff in 1900 and adopted a pension scheme for their benefit in 1935 is eloquent testimony to acceptance by the Chamber of social benefits far in advance of any government legislations. It is remarkable that, unlike today, the business community, acting through the Chamber of Commerce, did not suffer from any inhibitions, when a need arose, to enter the political arena and not necessarily in its own vested interests. For the record, in September 1917 the Chamber sent a communication addressed to the Prime Minister and the Secretary of State for India conveying its view of the time that Mrs. Annie Besant and her followers should be deported from India as the only means of effectively checking their activities in the cause of the Home Rule Movement which the Chamber considered were bound, sooner or later, to lead to serious trouble.